So, Kayak amused its travelers around (across?) the globe by replacing globe map destinations with flat earth maps, The Guardian warned its readers British Government is banning Brexit jokes because people can't tell reality from farce anymore. Tinder introduced new profile verification scheme for men who claim they are 6 ft tall and, video-streaming service adds 'skip touching scenes' feature for the Millenials. 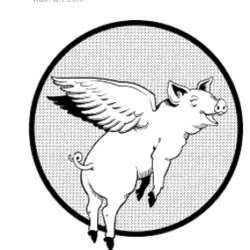 The Flying Pigs are for real.